Everyday Plus is now Extra Strength CBD Oil, the formula and content is exactly the same, just in a fresh look. Extra Strength CBD Oil is boosted 2x stronger than Everyday Hemp Oil and helps to address more specific wellness issues with the benefits of cannabinoids. Charlotte's Web Extra Strength pure hemp oil is best used for mind and body wellness to counter major bodily stresses. Charlotte's Web™ nurture each plant from seed to sale. The process begins on their family farms and ends at CW's FDA registered production facility. Before any batch leaves the facility, Charlotte's Web™ test it to guarantee it meets the highest standards. Each bottle of hemp oil they deliver is packed with the highest quality whole-plant extracts. CW Charlotte’s Web Extra Strength Oil dosage depends on every single individual. What could be a lot for some people could be little to others. 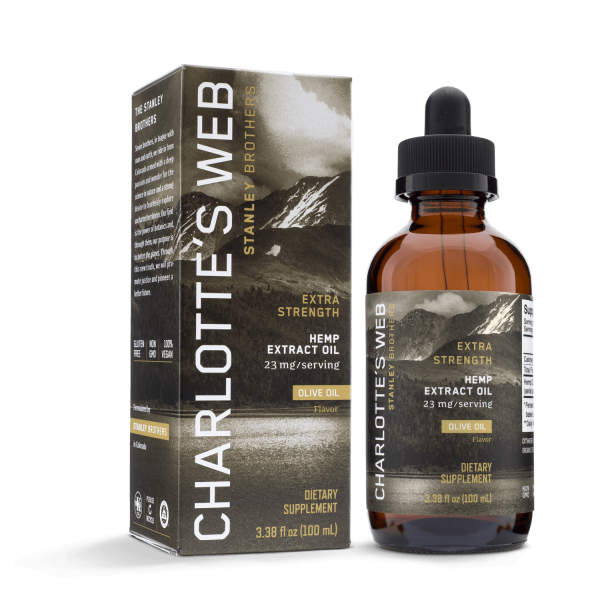 The package recommendation for Charlotte’s Web Extra Strength Oil is to take two full droppers (0.5ml) 2 times per day. Please note that the dropper will be half full, which indicates a full dropper. Avoid mouth contact to preserve the quality of the oil. Charlotte's web CBD products have had a positive effect on conditions such as: Relieving chronic pain, preventing epileptic seizures, helping with sleep disorders, anxiety, stress, Parkinson’s Disease, cancer and more. Other benefits are found in the cannabis strain this CBD oil comes from. Charlotte’s Web strain was specifically designed for containing low THC levels and very rich in CBD. This CBD Oil has proven to be highly effective. It works on its own without the help of additional supplements. Charlotte's web hemp oil uses are very wide. If you are considering taking this charlotte's web hemp extract, you should consider talking to a professional first. How much CBD is in Charlotte’s Web Extra Strength? This CBD Oil (30ml) contains 16.66 mg of CBD per ml of oil, 500 mg of CBD per entire bottle. The Stanley Brothers are a family of seven brothers from Colorado that together created CW Hemp. It all started due to a very unfortunate incident that one of the brothers had. Josh Stanley suffered a severe crash when trying to land his paraglider. This resulted in a series of back surgeries. He went through a long process to recover. During this recovery, he managed pain with the use of opioids medication. Unfortunately, as people using these drugs usually do, Josh develop a chemical addiction to them. Found in a very difficult situation in his life, a friend suggested the “cannabis tincture” as an alternative way to deal with pain. Josh was very reluctant first but went on and tried it. He was amazed at the results he got out to if and eventually formed CW Hemp with his brothers. Later on, Paige Figi (Charlotte’s mother), heard about the high CBD plant the Stanley Brothers were brewing and decided to contact them. They quickly figure out a way to try this CBD Oil with Charlotte and the results were impressive right away. They kept on going and eventually the story had national coverage with made these hemp extracts worldwide known.